Discussion in 'Map Factory' started by Michaelthurston, Dec 30, 2014. Hey there once again guys. I took a look at the progress I was making on my prior map, koth_something, and I decided to scrap it, and start over. So I bring you koth_Snowday! I'm taking things much slower this time around, and making sure that I don't get ahead of myself. As it says in the release notes this version is fully fleshed out, with lighting, and health/ammo placements. I'm looking for feedback/suggestions about map layout and health/ammo placement. Please let me know anything you have to say, good or bad. I want this map to be great! Looks pretty good at first glance! I must say, however, that the fifth screenshot looks like one huge sightline straight out of spawn... easy for snipers to camp. Very dark. Really the kind of map that probably needs some kind of artificial lighting all over the place. I know! I can't quite get it right...I am using the setup for doublecross. How should I go about adding proper lighting? Any help is very appreciated. @Captain Clam, Thank you sir! Could you show me exactly what you mean? I definitely don't want any unbalanced areas. While a little dark, the lighting is GORGEOUS! Thank you! So you would suggest just upping the brightness a bit? The environmental lighting on Doublecross is meant to leave unimportant areas in the dark while light entities are used to highlight play areas by contrast. So, the environmental light alone isn't enough - you'll definitely want to add more lights, especially around points of interest. Not all of them have to be attached to lighting fixtures, though! Look at the control point, for example - those spotlights don't cast much light by themselves, so throwing in a floating light_spot directly above the point would help to brighten an important combat area and draw attention to it while looking natural and believable. 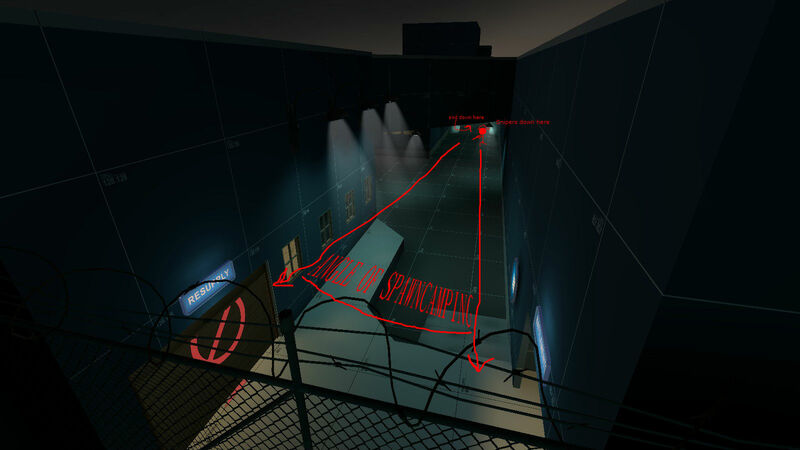 It's a little technique that often goes unnoticed by players, but it takes your map a long way! Also, consider highlighting each doorway with some kind of light so it's immediately apparent where players can come and go. Carefully placed lights can be almost as effective as arrow signs in pointing players around. Hey thanks a lot for the explanation! I really appreciate it. I've been focusing on fleshing out the buildings a bit more. I'm going to definitely give that a shot! I watched a tutorial that had explained plr_pipeline using random floating light_spots to achieve great looking light. Will do! I also try to do the same for health/ammo packs. Also, windows into spawn aren't such a good idea, either. Thanks a lot for the image! Gave me a good idea as to what needed to happen. Here's an album of the updated map! A3, because A2 for used for testing. I used random light_spots for more even lighting across the map, and it turned out beautiful. I still has that nighttime feel, but without being too dark or light. I added some more walls to prevent spawn camping, so we will see how that goes. Please continue to bring me feedback. I would absolutely love to get this map on a server for testing.